Hello, time for another SMSC. 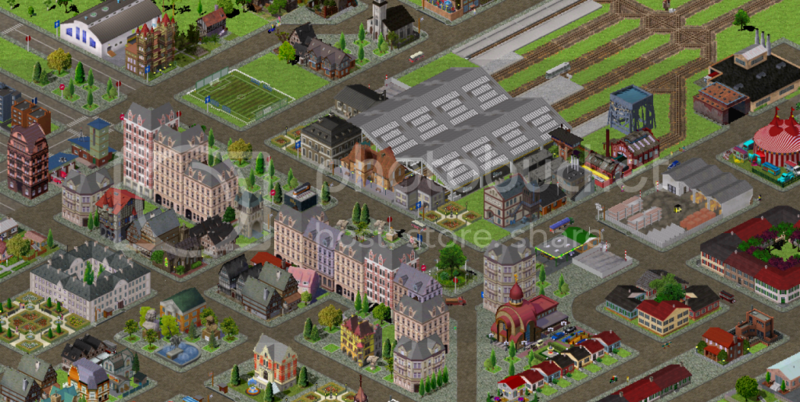 This time the topic is City Train Station. Of course, more can be shown in the picture, as well as the sation can have multiple transports, but it must primary look like a rail station and be in a city. This is a new town, founded to house the workers for a new line. The addition of these tracks to the network enabled the island's central station (serving Blackhampton, the largest city) several miles up the road, to be within commuting distance for half a dozen cities huddled along the river Slate (just East of the station). After construction had completed, the town was immediately overrun by people working in Blackhampton and saw a phenomenal rise in occupancy. In the picture it's mid-November and snowfall uphill has not made it into the neighbouring city of Piddon to the East due to the river's relative warmth keeping the area downwind ice-free. The RT130 leaving platform 1 is setting off towards Blackhampton in its morning schedule, about to complete its fourty mile journey north. 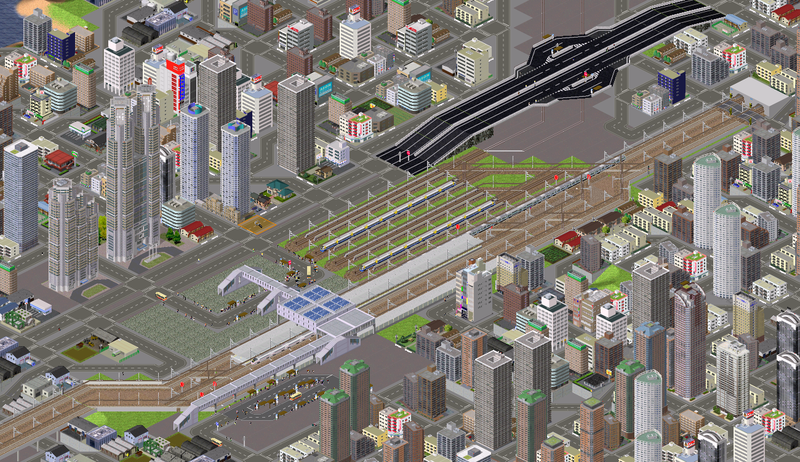 This is a station of mid-size city,Hachioji.Hachioji was a smalll villege 25years ago but now it has developed 287,000 people and some skyscraper. There are 4 storage track for out‐of‐service car at　west side of the station. Next station is the terminal of this line, so Ltd.Exp.car often comes back here and prepares for the next service. >>gauthier Thank you for your pointing my mistake out. Long ago, a group of small towns were connected to the major cities with an express train. Since then, the towns grew up much faster than expected so that the narrow array of tracks couldn't be enlarged. It was impossible to keep both high capacity and high speed until 2015, when engineers came up with a 200 kmph double-deck train, making the towns here a suburb of the major cities northward. pak : pak128 2.5.2 + SNFOS addon (z56500 EMU). The first railway station in Regensburg was built in the 1850s. 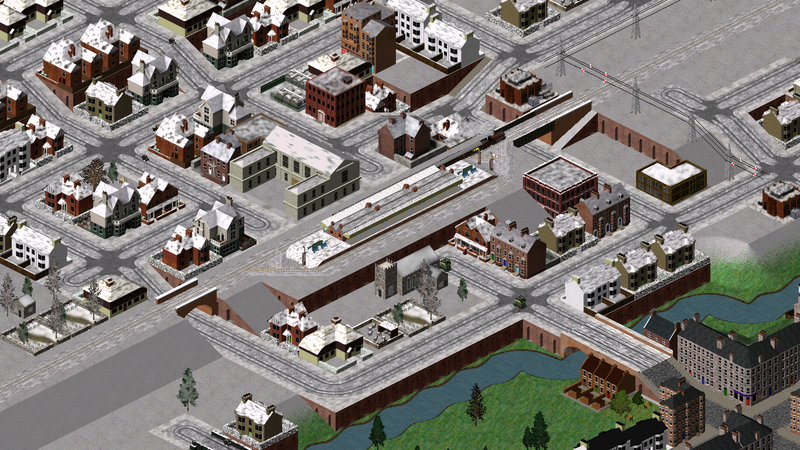 Since then the city has grown a lot, as well as the rail network. The station offers an urban rail connection to the northern and western quarters of Regensburg, and intercity connections to Mainz, Landshut and Stuttgart. The train on the rear rail track is a urban train hauled by a DB Br 39 steam locomotive and will turn in the station. The train in the front of the image is going to Stuttgart, the other one (both being hauled by a DB Br 01) is heading to Mainz. The freight train (Prussian P8) supplies the Regensburg brewery with grain. Public transport in Regensburg is maintained by buses, a subway line, and trams. This is a real game in pak64, with food addon. The Railway Station, the new city gate. Many cities destroyed their walls during the 19th Century to grow up. I have created a scenario with a city that demolished the old walls. Instead of them, we can see buildings, the old gate is the only part preserved. The place around the wall is now a boulevard. The railway station was built opposite the old gate. Near the old city there is an old town that became a suburb. Also, a new quarter was created: St'Michael's Quarter. This is a created scenario from pak 128 with Spanish Addons. You can get these and other addons at: The Simutrans Boxroom.